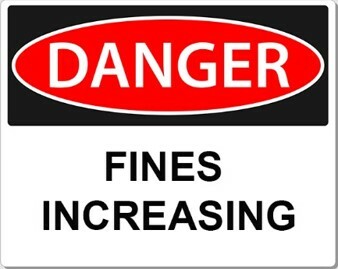 As of January 24th, penalties resulting from safety violations have increased for employers. The increases apply to citations issued after that date and for the remainder of 2019. · Failure to abate (per day), $13,260 (up from $12,675 last year). These increases only apply to federal OSHA states. However, it is expected that the 26 states operating their own occupational safety and health programs will align their penalty structure with federal OSHA so that the programs are equally effective. For future reference, DOL is required to adjust maximum OSHA penalties for inflation by January 15 of each new year.